We are having a wonderful summer. 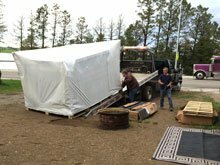 We arrived in Eureka, South Dakota on May 5th. Eureka is a small town about 80 miles northwest of Aberdeen. It is my husband's home town. Several years ago we purchased a lot that is almost on the lake in town. (We have a highway and a row of trees between us and the lake). It is a beautiful spot. Last year we had electrical, sewer and water put in. This allows us to pull our 5th wheel up and hook it up. It is a cross between having a cabin on a lake and having a camper that we can pull across the United States. 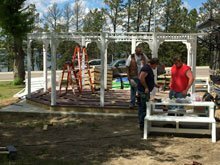 In order to expand our living space while we are in Eureka, we decided to build a gazebo. 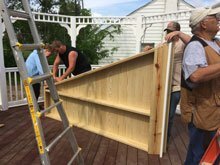 At first my husband thought he would build it from scratch. 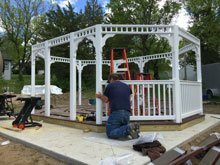 But then he saw a gazebo kit on the internet. It is manufactured by an Amish family in Pennsylvania. He has had such fun putting it up. 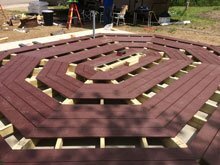 There are still a couple of things to do but it should be done this week. 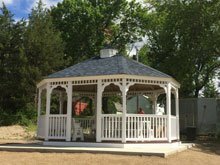 I've already worked on my applique project but am looking forward to setting up my sewing machine under it's beautiful dome. 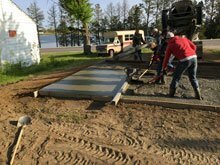 The foundation is poured. The kit arrives. The floor goes down. The frame goes up. The sides go on. The roof goes up in sections. 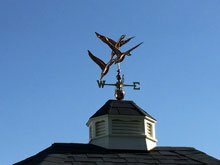 The weathervane goes up. Almost complete. How are needles and pins made? For many years, I have included in my quilt talks a hint about threading a needle. I have pointed out that needles are "machined" and that the eye of the needle is punched into the end. When you punch something, little burrs develop on the side where the punch comes out. To thread a needle easily, you need to thread from the same side the punch went in. If your thread doesn't want to go into the eye, just turn your needle 180 degrees - that is come in from the other side. This month I found this wonderful video on YouTube showing how pins and needles are made. Just click on this link and you can see how it is done. Coralie Williams has sent her next block in Karen's Gingerbread Florals, our current free BOM. It is lovely, Coralie tells me she is at work on a couple of more. One of these days I'll be sharing those with you also. I have added Coralie's block to my gallery. 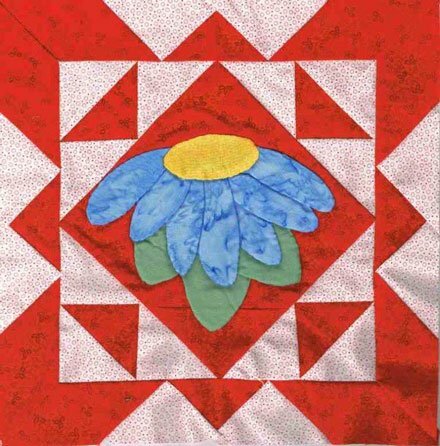 If you haven't explored it yet, just click on this link and you will see a variety of both quilts and blocks made from my patterns. I don't think I have ever been as excited about a BOM as I am about my next free one. Each day I can hardly wait to open my mail. I have created a folder in my e-mail for each of the options that you have been given. I dutifully move each e-mail to the appropriate folder. Then I check the count for the number of e-mails in each folder. This month it became apparent very early on that you wanted a row-by-row for your next free BOM. But when I checked the theme, I discovered that you had two very different desires. Many of you wanted a Christmas theme and others wanted sewing paraphernalia. Not in a million years would I have guessed the later. These two options bounced back and forth all month. This morning I cut off the voting and checked the counts. A Christmas theme got exactly 1 more vote than the sewing theme. My next free BOM will be a wall hanging/throw size Christmas row-by-row. However, so many of you wanted the sewing theme that I feel I need to do that as well. Don't know when I'll do it. Possibly it will be my 2018 free BOM or possibly I will make it into a pattern that I will sell. I'll have to see what my time allows. This month I have two questions for you. What degree of difficulty would you prefer? Click on this link to vote for the degree of difficulty. Place your number in the subject of the e-mail. Click here. a. Playful - Christmas toys, elves, etc.? b. Elegant - Flowers, candles, etc.? 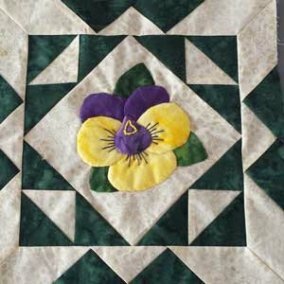 Click on this link to vote for the type of Christmas quilt that you would like. Place your letter in the subject of the e-mail. Click here. Please do not vote for both in the same e-mail. I have to throw those out. You may vote through June 30th. July 1st I'll begin designing the quilt based upon your selections. This month we will honor the little pansy. It is do-able in several different colors. Purple (lavenders) and golds will be the most popular. I did notice that my photo to the right is upside down. As I'm on vacation I can't correct it. 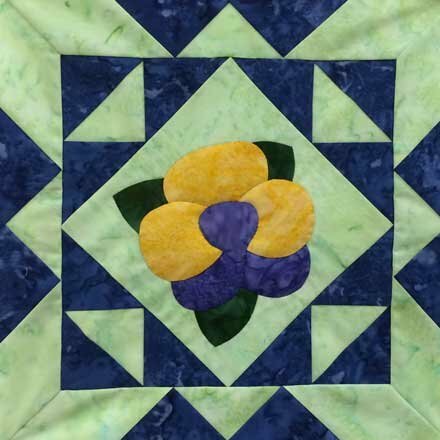 Click here to download the pansy block. Click here to download last month's water lily block. Here are Karen's (left) and Georgie's (right) pansy blocks. Don't you absolutely love Georgie's addition of the embroidery to her block. I will try to add it to my block before I set my quilt together. You can do the same. Just add some embroidered lines of various lengths around the center. It really adds a lot. 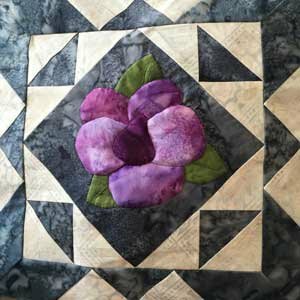 Click here to download April's "A Simple Rose" block. Click here to download this newsletter as a PDF file.